I hope you are having a good week! We FINALLY are getting cooler weather here. It is starting to really feel like Fall. 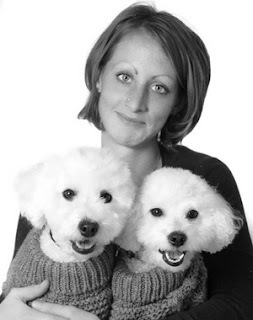 Today I would love to introduce you to Charlie and Baxter, two handsome Bichon Frise dogs. Their mother, Lindsay, was kind enough to stop by the blog for an interview. 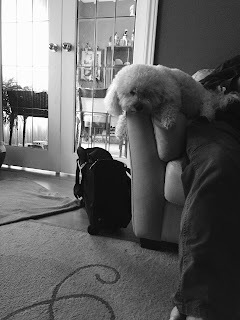 Lindsay blogs at The Flynnigans, and you'll find more Charlie and Baxter there. Abby: Who are your pets (names, breeds, ages)? Lindsay: Charlie 9, Baxter 8. Both Bichon Frise. Both share the same mother and father, they are just a litter apart. 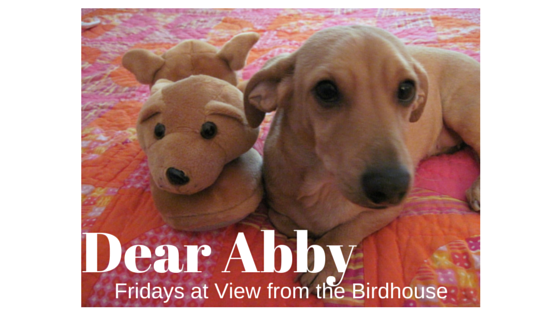 Abby: Is there a story behind any of your pets' names? Lindsay: Charles Xavier Flynn - Charles after my late grandfather, Xavier after Professor X in X-Men and Flynn is our last name. 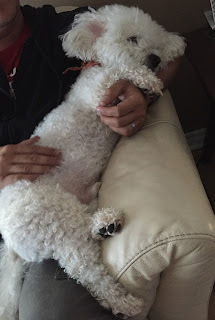 Baxter Burgundy Flynn - Baxter because my husband wanted to name him Buster and I refused because I didn't think Buster suited the name being white little fluffy dog, so in the end, Baxter it was. :) His middle name was inspired by Ron Burgundy in the Anchorman movie. Abby: What is the funniest thing your pets have done? Lindsay: I can't say that one time in particular stands out in my mind, but the boys are constantly doing funny things and making my husband and I both smile and laugh. Abby: Have your pets had any adventures? Lindsay: The boys have never been on a plane but they do enjoy getting down and dirty camping with us usually once a year. Abby: What do you and your pets do for fun? Lindsay: We have play dates with friends or at my mom's house (she has three bichons). They love being doted on and loving on Mommy and Daddy. They love snoozing and Charlie loves watching tv. Abby: Do your pets have any favorite, special toys? Lindsay: Charlie isn't particular with his toys. He has a basket of toys, some he played with back when he was a puppy that he still gravitates to. Abby: What are some special things your pets can do? Lindsay: We've always taken pride in teaching them both to sit, down, shake a paw (both sides), high five and twirl like a circus animal all roughly by the age of 4 months, the twirling trick taking longer than the others. Another thing we are proud of is Charlie's modeling career when he was 6 months to two years old. We had so much fun taking him to photo shoots and auditions but it was hard work, and had we wanted him to get into it more, we would've had to hire a handler, and at that point you have to question whether you want your dog as a family pet or you want them to be a working dog, both different from the other. It's just a whole different lifestyle when you have working pets that are constantly working, going to auditions. It was exhausting but a lot fun nonetheless. Abby: What are your pets' most lovable qualities? Thank you, Lindsay, Charlie, and Baxter, for stopping by today! I loved hearing about the boys' modeling career and the fun they have. I love their full names too! Readers, you can leave comments and questions for Lindsay in the comments, below. If you have pets who would enjoy being spotlighted here, please let me know! Be sure to leave your email in the comments if you want to do a spotlight. I love this Trish!! :) For a split second I forgot this was going live and then saw my fluffy little heads as the image in my Feedly. Cute little interview, makes me think of my handsome German shepherd I lost a few months back. Good looking pups! Great interview, Abby! I loved hearing about Charlie and Baxter, and I especially enjoyed all the pictures of them and their pretty Mom, Lindsay. Thank you for doing such a great job! I always look forward to your Meet and Greet on Fridays! I love the pics of them in sweaters! What are they doing in the water? Is that a treadmill underwater? Aw, they are too cute! I love hearing about other people's animals. I have one dog and I just think she's the cutest little thing ever, even though she's not as small as these two and she's almost 14 years old! It's crazy!!! Lindsay, thank you again for visiting and sharing Charlie and Baxter here! They are such cute, smart pups! Friends, thank you all for visiting. I love reading your comments! The underwater treadmill we used for Charlie's rehab post CCL surgery a year ago last June. It's such a great rehab tool and Charlie loved it, it was a lot of fun and purposeful. Lindsay, that is wonderful that the underwater treadmill helped Charlie rehab post surgery!